Air conditioners that are considered eco friendly are those that use anywhere from 10 to 50 percent less energy that other types of air conditioners. Eco friendly air conditioning units are those the have been labeled Energy Star by the U.S.
Environmental Protection Agency. The Energy Star label helps consumers know that they are purchasing a product that can help reduce greenhouse emissions as well as other pollutants. While there is not one brand that is better than another, the most important thing to look for when shopping for an eco friendly air conditioner is the Energy Star Label. The size of the air conditioner needed for the home will depend on the square footage to be cooled. Other factors to take into consideration include: number of doors and windows, shading, insulation, number of people living in the home, and appliances used. Bigger does not equal better. Proper and routine maintenance can help homeowners ensure that their air conditioner is operating at its maximum capacity. It is important to clean or replace filters on a regular basis. Yearly servicing is needed to keep the unit operating efficiently. Homeowners should determine their comfort level and set their thermostat accordingly. It is best to leave the thermostat set a the same temperature all year long. It is recommended that homeowners set their thermostat at 78 degrees. The higher the setting, the less the air conditioning unit will operate. Installing ceiling fans will help your air conditioning unit operate more efficiently. Fans help to evenly distribute cool air throughout a room. Fans do not require a lot of energy to operate; therefore, using fans will not dramatically increase the home's energy consumption. Keeping the shades drawn in the home will help keep out excess sunlight and heat. Planting trees or other plants around the home can provide additional shading for the home. It is also ideal to have the outside air conditioner unit shaded as well. It is estimated that shaded air is approximately 6 degree cooler than air that is not shaded. 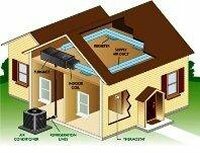 This will help the eco friendly, Energy Star unit to operate more efficiently. 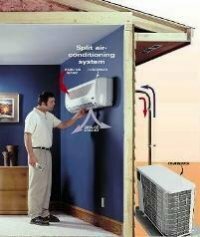 Mary Mattoon writes for http://www.splitairconditioning.net, her personal hobby blog focused on tips to consume less energy using home air conditioning systems.